SAIL BLACK ROCK, which sponsors the intercollegiate sailing teams of Fairfield and Sacred Heart Universities at Captain’s Cove Seaport in Black Rock, CT, hosted its first NESSA high school regatta, known as the Great Oaks Qualifier, on Saturday, September 12. Nine teams competed, including Xavier and Litchfield from upstate Connecticut, local teams Fairfield Prep and Fairfield Ludlowe, Massachusetts teams Marblehead and Martha’s Vineyard (via ferry! ), Moses Brown from Rhode Island, and Falmouth and Portland High Schools from Maine. 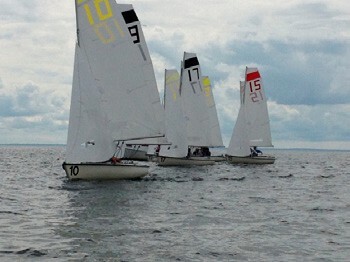 Fleet racing in FJs began in light conditions of about 6 knots from the east that built to about 11 knots in the afternoon, providing consistent racing off St. Mary’s Point, at the western mouth of Black Rock Harbor on Long Island Sound. The teams were the first to use SAIL BLACK ROCK’s brand new sails from Intensity Sails which have avant-garde squareheaded mains. The Race Committee, comprising SAIL BLACK ROCK’s Primary Race Coach Jill Fattibene and Technical Race Coach Jamie Fales, performed flawlessly, running nine 18-minute races aboard the lobster boat Clammer, graciously donated by J. Russell Jinishian, owner of the country’s largest marine art gallery, located in nearby Fairfield. Xavier’s Gorden and Stewart Gurnell claimed first place, followed by Falmouth’s Cameron Loncoski and Peter Morrissette in second. Fairfield Prep took third, with Mathew Sweeny and James Paul as skippers and Christian Haranzo and Grant Ballesteros as crew. These three teams qualified for the Great Oaks National Invitational at Southern Yacht Club in New Orleans, LA in November. A highlight of the day, in addition to the perfect racing conditions, was the free ice cream provided to each competitor.